This is simply one of the best board game apps available to date. Star Realms is a popular two player deckbuilding game in which you battle your opponent in a race to deplete each other's Authority to zero, accomplished by directly attacking them. The classic deckbuilding tropes are all in play here. Both players start with minimal purchase and attack power, and must choose how they spend to build their engines. Increase purchase power to acquire better cards to acquire more cards to better combine abilities to destroy your opponent. Once familiar with the rules and the app controls, a game usually takes about ten minutes. Gameplay starts with five face up cards which form Trade Row and can be purchased for various Trade unit amounts, they are replaced from the deck after being purchased. Both players start with identical decks; seven single Trade cards and three single Combat cards. You receive five cards from your shuffled deck and start purchasing and attacking. Players will build up their deck over the course of the game, adding powerful cards, trashing weaker cards, eventually leading to an all out battle, or sometimes a massacre. After each turn, played cards are discarded, and five new cards are drawn from your deck. If your deck is empty, your discard pile gets shuffled and you continue drawing from there. The crux of Star Realms are the four unique factions in play. With only a small handful of exceptions, every card in the game belongs to one of the four factions. Individual cards of a faction usually get more powerful when played in the same turn as a separate card of matching factions. The added powers can be extra Trade or Combat units, earning extra card draws, or a wide range of other abilities which will prove crucial to your chances of winning. The factions each have their own strengths and choosing how to combine multiple factions in one game is often the difference between winning and losing. Do you combine the Trade/Authority-generating faction with the card trashing faction? How about the Combat-focused faction with the faction which uniquely has the ability to force your opponent to discard before their next turn? Choosing which factions to buy into, and maybe even more importantly, which to avoid, in each game is the crucial decision point and changes every game based on what is available. It is a testament to the game design that the factions are both unique and balanced, there is no single overpowered combination. The fun, strategy, and challenge of the game are all derived from seeing what combination of abilities you can get into your deck and unleash on your opponent. Star Realms contains a rulebook and a tutorial series. The rulebook button in the app takes you to the “How To Play” page on the game's website. The tutorial consists of essentially four mini tutorials, each lasting only a couple of minutes showing off a very specific subset of the rules. The tutorials do get the basic ideas across, but they are so short that it’s almost certain that not all of it will sink in. It was a handful of games in before I felt I had a strong handle on the basic rules of the game. It was dozens before I started to feel like I could put together a winning strategy. There’s nothing wrong with a learning curve for the strategy, but I would have preferred a more robust tutorial to drive home the basics. Quite simply, this is how board game app multiplayer should be done. If you want to play online you have two options: challenge a specific player by username or go into random matchmaking. If you go into matchmaking you have two more options. First, play a short (3 minutes per turn) or long (48 hours per turn) game. Second, Quick Match (first available) or Selective (pick exactly which subset of your expansions you want to use). You make your choices, hit “Start” and then….you do nothing. Which is fantastic. Many games we’ve played require waiting in a lobby until matches are found. With Star Realms you can start matchmaking and then leave the app, you will get notified when something is found, and it rarely takes long to find a game. Finally, there is a pass-and-play option if you don’t own the board game or don't feel like shuffling the cards. 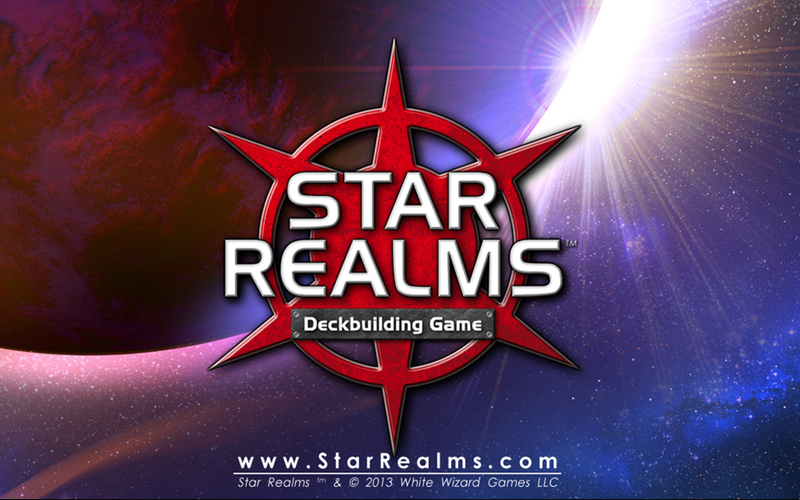 Star Realms introduced a new online play mode, Arena, with an update. You can read all of the details here, but the short version is that it is a weekly online tournament mode where a new set of rules are offered each week. This is a fun addition to the standard online mode, but there is a "pay to play" aspect it, although your first tournament each week is free. Star Realms provides all you could want for in a single player board game app, the list is pretty small but it’s still amazing how few manage to achieve it: Campaign mode and competent/adjustable AI. The Campaign mode doesn’t make sense for all games, but it’s extremely well implemented here. You get three different chapters in the base game, with an average of seven or eight missions per chapter. You are dropped into a specific scenario and can earn one, two, or three stars with a win. The stars you earn are based on how well you perform and add replay value to an already impressive mode. The variation in the missions really make Campaign shine. Missions have unique starting conditions and often special rules which make them interesting extensions of the base game, each mission can be played in Normal or Hard mode. Aside from a great Campaign mode, you can play a standard game against AI with Easy, Medium, and Hard difficulty levels. Easy is good for learning. A seasoned player will lose to the Medium Bot occasionally, it doesn’t always make optimal decisions but it will take advantage of mistakes. I've had this game for about four years now, playing mostly online. I honestly don't lose to the Hard AI all that often because years of online beatings have taught me some strategy, but many of my Hard AI games are often very close. The Hard Bot seems to prefer a slow build strategy, frequently coming up a round or two short, but it is good enough to punish you for poor play. Note that the Hard mode in Campaign gives you extra starting disadvantages as well as increasing AI difficulty, so the campaign mode remains a challenge even if you can regularly defeat Hard Bot. The Android version is Freemium. Everything I’ve been describing so far (except when I mention expansions) assumes you bought the full version of the base game. The free version doesn't allow you to play online or pass-and-play and only unlocks one chapter of the campaign. It lets you get a taste for the game before making the purchase. Additionally, there are five expansions available as in-app purchases. The expansions unlock a new chapter for Campaign mode. After that they provide one or both of the following: new ship and base cards for each faction or a new card type which introduces new gameplay mechanics. The Gambit expansion, for example, provides both. Each player is dealt two out of the eight new Gambit cards before the game beings. These cards give the player a power, sometimes a one-time use, sometimes ongoing. This expansion also adds one ship and base card per faction. Similar to the Gambit expansion, the Events and the Heroes expansions each add new card types but without the extra ships and bases. The following add only new ships and bases: Bases and Battleships and Fleets and Fortresses. You can play any non-Campaign mode (online, pass-and-play, vs. AI) with all, any, or none of your purchased expansions. Usually by the time I get to this point in the review I have a few items I couldn't fit in elsewhere, but I've spent 1,300 words gushing about every aspect of this game so I'll keep this one short: we highly recommend this game. It has one of the best multiplayer implementations out there and a robust, challenging set of offline modes. If the game appeals the you at all, it's worth picking up this extremely well made app. One of the best multiplayer implementations out there with a robust and challenging set of offline modes.